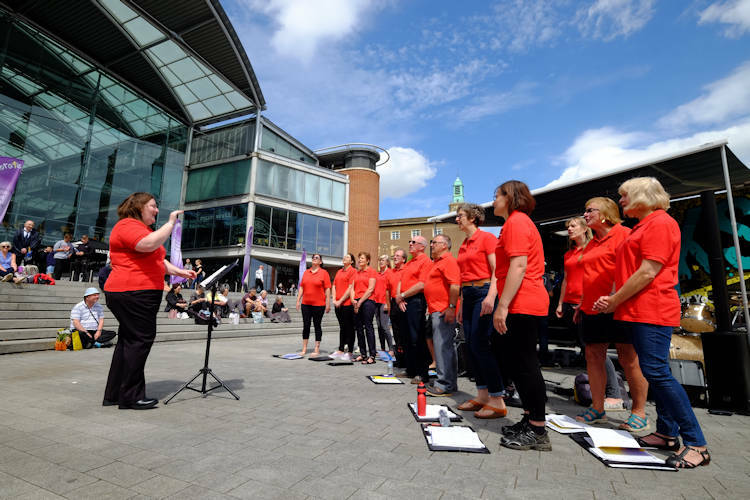 Celebrate Norfolk is aiming to fill the Forum and Millennium Plain in Norwich with heavenly sounds at its flagship event on Saturday 29 June and wants choirs and music groups to help. “There is a great opportunity for choirs, music groups and the like to contribute to the atmosphere on Millennium Plain this year at Celebrate 2019. In our tenth anniversary year we want to bang the drum, grab attention and proclaim our message by all sorts of music. “In short we want to make it a carnival atmosphere as we celebrate what the Lord is doing through the rich diversity of churches and ministries which flourish in our city and county. We already have some choirs booked up and ready to go so why not join the programme and show off what you do in this great public arena at the heart of our city. “The more musical styles the better. Everything from jazz and pop to classical whatever your expression come and share it with a waiting world. Who knows but that someone may be touched by what and how you proclaim the message of the kingdom. “Get in touch and let us know your availability as there is a time slot waiting just for you but hurry as we shall need to finalise the programme soon." This article comes courtesy of Network Norwich.